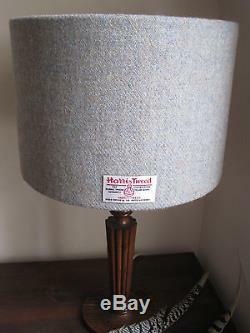 Beautiful genuine Harris Tweed lampshade in a plain duck egg blue tweed. A lovely addition to a study or a country style home, these lampshades add a touch of the Hebrides. 40cm and 45cm diameters work very well with standard lamp bases. Other sizes are available, 20cm dia, 25cm, 30 and 35cm x 25cms high. Available in 30cms high at an additional cost. The lampshade ring and lamp fitting are epoxy coated and the internal lampshade panel is safe to use with regular 40W candle bulbs, however, low energy candle bulbs are recommended as they are cooler to the touch. Drum shades include a converter ring to adapt to UK/European fittings. Also available in other colourways, please see my other listings for designs. Please note there may be additional postal charges to Higlands, Islands and Northern Ireland. 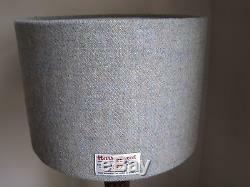 The item "Handmade Harris Tweed Drum Lampshade in Duck Egg Blue" is in sale since Friday, September 14, 2018. This item is in the category "Home, Furniture & DIY\Lighting\Lampshades & Lightshades". 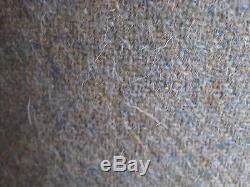 The seller is "pollydog11" and is located in Bristol. This item can be shipped to United Kingdom, Austria, Belgium, Bulgaria, Croatia, Cyprus, Czech republic, Denmark, Estonia, Finland, France, Germany, Greece, Hungary, Ireland, Italy, Latvia, Lithuania, Luxembourg, Malta, Netherlands, Poland, Portugal, Romania, Slovakia, Slovenia, Spain, Sweden, Australia, United States, Canada, Brazil, Japan, New Zealand, China, Israel, Hong Kong, Norway, Indonesia, Malaysia, Mexico, Singapore, South Korea, Switzerland, Taiwan, Thailand, Chile.